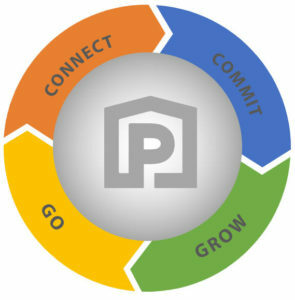 Through personal invitation, outreach, online social media or other marketing, people connect with PPC in three ways: Life Groups, Sunday Services and Community Involvement. On Sunday mornings, first time guests are encouraged to fill out a Connect card and meet the Pastor at Guest Services immediately following service. Returning guests on Sundays are encouraged to arrive at 10:00 a.m. to help out in areas such as set-up/takedown, hospitality, guest services and the parking ministry as their schedule permits. Continual opportunities are offered to be present and serving in our local communities and part of Life Groups growing and doing life together. It has been wisely stated, “A church is not like a family, it is a family!” When we become followers of Christ, God expects us to be members of a church family (Romans 12:4-5). Ephesians 2:19 says, “…you are…fellow citizens with God’s people and members of God’s household…” Joining a church expresses our commitment, allows us to experience Christian unity and to exercise our spiritual gifts. Commitment at Perimeter Pointe Church includes taking the New Members’ Class, having been Scripturally Baptized, and agreeing to a Membership Covenant. Consistent participation in Life Groups, Sunday Services and Community Involvement helps facilitate spiritual growth, while additional training is needed to become leaders and disciple-makers in our families, workplace, communities and the church. Specialized curricula, courses, seminars and training will be offered on a host of topics to equip us to fulfill our unique God-given purpose for our lives (Ephesians 2:10). Growing disciples are going disciples! We are to employ our spiritual gifts to make an impact in this generation through the church, our workplace, families and other relationships. Paul says to Timothy “…stir up the gift that is within you…!” And Jesus expresses our going and serving in this way: “By this all men will know that you are my disciples, if you have love for one another” (John 13:35). Ongoing opportunities to be on mission and share the love of Jesus Christ will be offered both inside and outside the four walls of PPC.